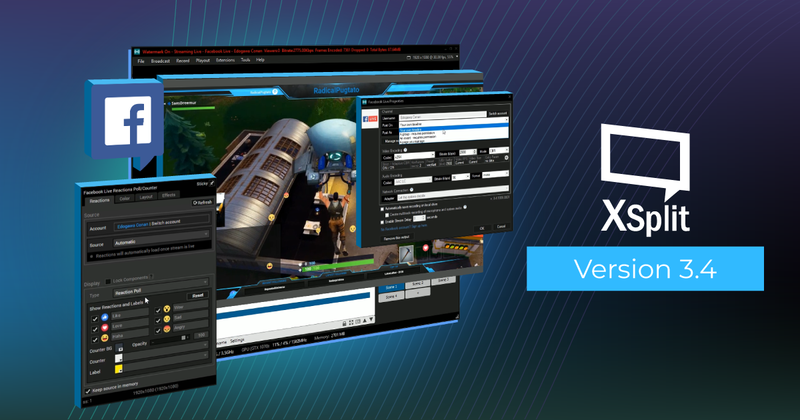 XSplit 3.4 is now live and available for download, featuring an improved overall experience that makes streaming easier than ever before. In this release we have focused on UI and usability improvements, along with several improvements targeted at Facebook users. We have also made a whole host of other improvements under the hood, paving the way for a better and more powerful streaming experience, including further improvements for Facebook, Twitch, Youtube and Mixer users planned with our future updates. We've cleaned up the Output menu on your top bar with the three basic Output functions occupying their own menu. You'll see your streaming outputs under Broadcast, and Local Recording and Playout features like NDI occupying their own menus as well. Additional visual cues were added to these menus so you can better tell at a glance what outputs are running under each category, as we know how precious each second is when you're live. Sources can now be only accessed from the source list box, and we've made it easier for users with multiple widgets for each service installed to find the right output as each service would have it's own group in the source menu. Source widgets have been beefed up, starting with Facebook. The Facebook Live plugins have been improved to automatically connect to your live videos, eliminating the step of manually retrieving video ID's after you've gone live. If you're signed in to XSplit using Facebook, all your Facebook widgets and outputs should now always be signed-in automatically as well. Stream directly through your feed or any of the Pages you manage. Streams can also appear on fb.gg, Facebook's new gaming video destination for discovering gaming video content. A new source widget, Facebook Live Reactions Animation, has also been made, and it'll make your Facebook Live streams more interactive than ever as you can embed the stream of Reaction emojis that viewers send into your video. For the full list of new features and bug fixes in this update, refer to the release notes for XSplit Broadcaster. We’re excited to hear your feedback and as always, happy streaming! Social Media Manager and main blog writer of XSplit. He can be found @melvinblog but his tweets are anything but interesting.